A couple of years back, while working for a consumer credit bureau, a Fintech start-up entrepreneur discussed an idea with me. It was a lending model that involved three entities: The cab Aggregator, the driver of the cab aggregator and a lender. It was a very simple model where the driver would take a loan from the lender to buy a smartphone. The cab aggregator in this case, transferred the initial earnings of the driver directly to the lender. There were two parts that were particularly interesting about this model. Firstly, the entire transaction would happen in thirty minutes and secondly, the ticket size was between Rs 7,000- 10,000. This is the power of Fintech. What was remarkable about the Fintech model was not only the time or cost or ticket size, it was also about accessibility. If we observe the time and cost and what has happened as a result of Fintech, we can see, in the insurance industry the motor insurance claims settlement period has been reduced to around twenty minutes from seven days earlier. Similarly, from three days to clear a cheque or a demand draft, it is almost instant now. Furthermore, the minimum personal loan tenure of one year for a minimum amount of Rs 30,000 has now been reduced to three months and the ticket size is as low as Rs 1,000. The Customer Acquisition Cost for a bank used to be Rs 1,500 which has now gone down to Rs 150. Similarly, cost to originate a loan, which was between Rs 7,000 and Rs 200,000 has gone down to a few thousands. Transaction costs for bank i.e. operational cost that a bank incurs in servicing per customer through its physical infrastructure have also seen a considerable decline as it has gone down to one rupee from Rs 40 –50. While the numbers on reduced time and cost are outstanding, the big story about Fintech is how a whole different set of customers is brought into the industry by bringing down the ticket size and increasing the speed of delivery. An easier way to understand this would be to refer to something that had been in existence before Fintech. This is about the Micro-finance industry. They primarily lent to women with a ticket size as low as Rs 2,000, while in the banking industry the minimum ticket size was around Rs 30,000. The Micro-finance industry with smaller ticket size managed to bring in 50 – 100 million new consumers into the formal financial sector. It has brought in some of the most vulnerable borrowers and has helped transform their lives. 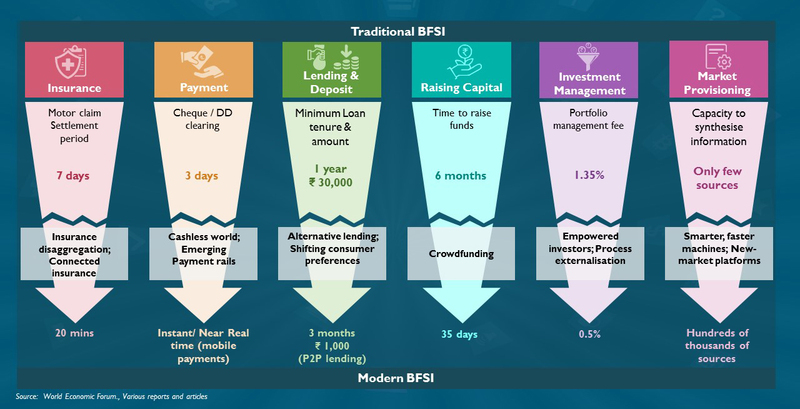 This is an example of how we can include different consumers into the formal financial sector by changing the whole structure of speed or cost of delivering financial services. So what is happening in India and what is holding India back from the kind of growth that has been achieved in the financial services sector at other countries? At Dun & Bradstreet, we studied different aspects of the financial sector and found that there are four things that have held us back to broaden the access and depth of financial services. These four things are: Regulatory and infrastructure barriers, technology barriers, lack of delivery agility, and behaviour and attitude issues of customers. The impact of that can be assessed by the presence of India in the overall landscape of financial depth and financial access. We plotted a pictorial chart to outline the matrix of financial depth and access. In the graph below the X-axis represents financial depth measured by private sector credit, pension fund assets, mutual fund assets, life & nonlife insurance premiums as a percentage to GDP. The Y-axis represents financial access measured by access to bank branches and ATMs i.e. as a percentage of the adult population of the country the level of physical access to financial infrastructure. There are thus four quadrants. The bottom left quadrant, represents low access and low depth while the top right quadrant represents high access and high depth. We then plotted data for 145 countries in the chart for the year 1985 and 2016 to observe how countries have evolved over three decades. In 1985, we had India at the bottom left which meant low access and low depth along with other countries like China, Brazil, and Indonesia. If we fast forward to the year 2016, we see that all the other countries have moved out of the bottom left quadrant while India is still there. Some countries have moved towards higher levels of depth first and then moved up to higher levels of access. Indonesia, on the other hand, has moved up to higher levels of access and will presumably move towards higher levels of depth if their trajectory is maintained. We notice that Brazil, China, and South Africa have joined Germany, France, Japan, US, Switzerland, and other countries who were already at the top right quadrant in terms of depth and access. The impact of development in Fintech on GDP is tremendous. 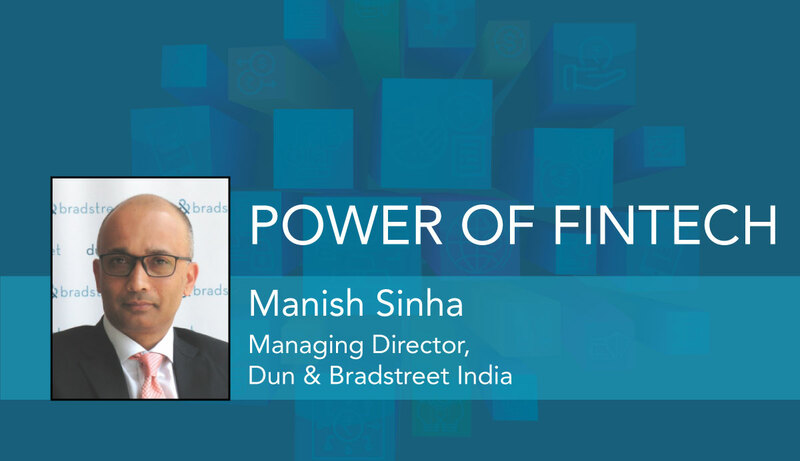 At Dun & Bradstreet, we have modelled GDP growth and linked it to what happens if an economy remains a cash economy, or moves from cash to digital, and further moves from digital to Fintech. If the economy embraces Fintech it will have the highest trajectory. By 2040, the amount of additional GDP we that we can add to the current trajectory if we embrace Fintech successfully will be equal to sum of the GDP that we have added since independence. This shows what Fintech can do for India. To sum up, the remarkable metrics about the time and cost reduction in the delivery of financial services by Fintech shows how disruptive Fintech has been. But the bigger story is about the financial accessibility. New and untouched customer segments are able to access financial products and Fintech has broken the barriers that have held back the financial development in India. Even after thirty years, we are still in the same quadrant in terms of low depth and low access while other countries have moved out and moved to higher levels of depth and access. The impact of embracing Fintech in India will be adding an incremental GDP over the next 20 years which is equal to sum of GDP that has been added since independence till now. That is the impact of Fintech.